The original Fast Food (Atari 2600, 1982) was an obscure bargain bin title. It was not an obvious choice to resurrect 35 years later, but here we are. Like the original you move a chomping set of lips around the screen consuming food items that rapidly approach from the left. As you might guess the game has made a dramatic leap in the audio/visual department. The food items are now digitized, and there's a lot more to chow down on including hot dogs, pink donuts, spinning sundaes, rotating tacos, and flapping pizza slices. Food items tend to clump together in groups, making it easy to rack up big points but at the risk of accidentally ingesting a nasty purple pickle. Eat six of those and it's game over. 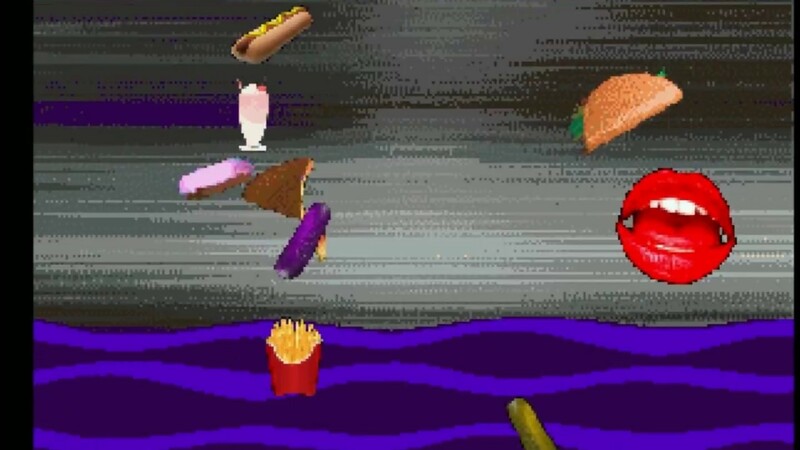 Fast Food 64 may be shallow but there's something about its weird, offbeat style. The bumping techno beats sound like something from the 1990's but the audio quality could be better. The psychedelic backdrops can be pretty mesmerizing if they don't make you sick. Each frantic game only lasts a minute or so, but you'll want to play over and over for high score. My friends were highly dismissive except for Brad who became hooked on Fast Food 64, rightly pointing out it required no buttons to play! How many games can you say that about? 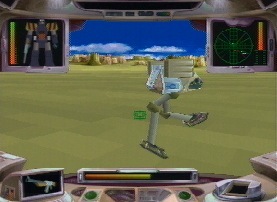 Secondary modes include a chaotic two-player variation and a confusing first-person "VR mode". Classic mode mimics the original's graphics but throws a lot more food your way. The box comes with a little laminated menu (and overlay) which is a nice touch. This homebrew doesn't try too hard, but if you're in the mood for something light Fast Food 64 might just hit the spot. © Copyright 2019 The Video Game Critic. Following in the footsteps of EA's FIFA series, this is a highly playable, fast-moving soccer game. In fact, the frenetic pace makes it hard to keep track of the ball! Over 50 teams are available to play in tournament or exhibition modes. The action is viewed from an overhead diagonal view. The ball looks sharp and its movement is smooth and realistic. It's easy to pass the ball around, despite the lack of a "scanner" to track your players. When you pass up field there's usually someone in the vicinity to receive it. Special moves are available for "star players", but apparently there aren't many stars on my USA team (*sad face*). The action is too frenzied to get all that creative, but I do like the ability to bend shots (like Beckham). It's not hard to score, but since the goal is usually off the screen, it can be hard to tell where to aim. Goalies usually get their hands on the ball but rarely make a clean catch. When someone scores you're subjected to a "celebration" screen featuring a pair of players that look more like hideous, overweight mutants. It's disturbing! Tie games are decided by shootout rounds, which are fun and well designed. 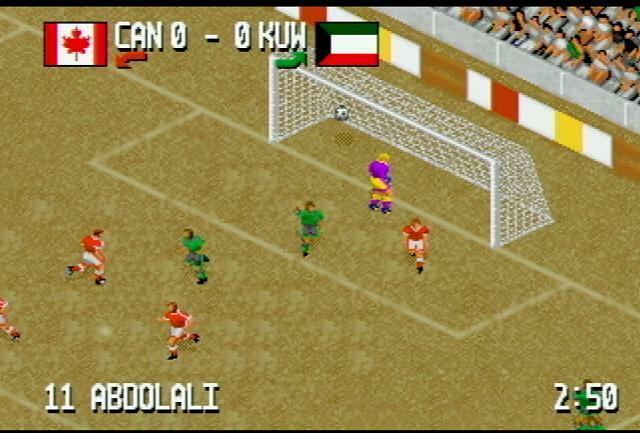 The sound effects include a crowd that increases in volume as the ball approaches the goal. The players grunts sound clear but the sound of kicking the ball sounds more like a shotgun blast! It's not perfect, but Fever Pitch Soccer is easily one of the more playable sports titles for the system. © Copyright 2013 The Video Game Critic. Video games are supposed to be fun right? Somebody needs to remind me after playing the monumentally abysmal Fight For Life. Reviewing this wretched one-on-one fighter is best described as a hardship. Fight For Life redefines the word "bad", with shabby visuals and pointless gameplay. Even in 1995, its blocky, texture-mapped fighters looked ugly. The backgrounds are sharp and colorful, but Fight For Life's basic gameplay is a complete joke. The characters can side-step and evade attacks, but they move like snails! Could they possibly take smaller steps? There's minimal technique involved in the fighting action, and each hit only removes a tiny sliver of your opponent's life meter. As both fighters endlessly trade punches, generic guitar music loops in the background. After what feels like an eternity, your opponent finally falls to the ground. But the sense of relief quickly turns into despair when you realize you're just beginning round two. NOOOOOOOOO! The one amusing aspect of this game lies in its instruction book, which claims you can save your game up to 100,000 times (sorry, you'll need to reset the cartridge after that). Is that supposed to be funny!? 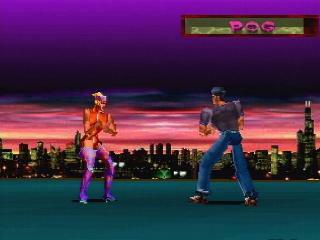 Did Atari really expect this to compete with Virtua Fighter and Tekken!? There has to be more to life than this! © Copyright 2006 The Video Game Critic. Simple-but-addictive puzzle games were the flavor of the month in the mid-1990's, and Flip Out was Atari's feeble attempt to grab a piece of the pie. But as this game taught me, the ability to manipulate colored objects does not always result in a good time. The game is played in rounds, with the idea being to flip square chips on a matrix to match a certain pattern. It's pretty confusing at first, but once you get the hang of it, it's just tedious. By incorporating a whimsical soundtrack, goofy aliens, and the occasional fart sound effect, Atari hoped you might not notice how much fun you weren't having! Unlike similar puzzle titles, there's never any pay-off in the form of explosions or chain reactions. I can't recall the last time I've been more disinterested in a video game. © Copyright 2006 The Video Game Critic. Most classic gamers can probably surmise from the title that this is a translation of the old Frogs and Flies (Atari 2600, 1982) game, also known as Frog Bog (Intellivision, 1982). Those games were simple yet fun, so you'd expect this 64-bit CD edition to be gangbusters. Fire up the CD and you're treated to an attractive title screen with catchy, twangy music. There are one and two player options. So far so good. Then you start playing and wonder if this is even a finished game. 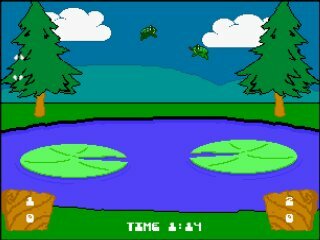 Frog Feast is a contest between two amphibians leaping between a pair of lily pads, snagging flies that flutter over the pond to earn points. The game is timed and ends after two minutes. In the original versions you could control the height and trajectory of your leap, but not here. You always jump the same height and distance, which is lame. One button is used to both jump and stick out your tongue. It occurred to me there are 22 buttons on my Jaguar Pro controller, yet this game uses one to perform two functions. The frogs are well-defined but the forest background looks like it was drawn with Microsoft Paint. The sky darkens slightly as you play but never actually turns to night. The sound effects are basically limited to periodic croaks. Only the Jaguar could mess up a can't-miss concept like this. 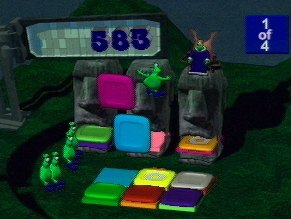 Frog Feast is actually a watered-down version of an already simplistic game, prompting my friend Scott to proclaim the Jaguar as the "reverse King Midas" of game consoles. © Copyright 2015 The Video Game Critic. This is the game Jaguar fans don't want you to see, because it exposes the Jaguar CD as the complete farce that it is. Highlander's intro features a lengthy animated sequence lifted directly from the TV series. There was a TV series? Hey, I'm as surprised as you! You then assume the role of an unarmed young man being hunted by soldiers in a burnt-out village. The high-resolution, pre-rendered scenery looks good, and the otherworldly soundtrack would be quite effective - in a good game. Unfortunately, your pixilated character is composed of about five triangles, and he moves like a turtle. You'd think a 64-bit powerhouse like the Jaguar would be able to handle a 3D adventure, but it struggles mightily. Simply wandering around the village is a chore due to sluggish, awkward controls. Making matters worse are the constantly changing camera angles. Not only are these disorienting, but take forever to render! Once the soldiers get close enough attack with clubs, you'll take a beating regardless of whether their blows actually make contact. This causes you to temporarily lose control, making you susceptible to further beat-downs. When will the hurting stop?! You can punch and kick until the cows come home, but your foes are always about a millimeter out of range. You'll find items in huts around the village, but just when you think you've come upon something useful (like a stick), you're told "you can't use that here". Attempting to flee the village causes you to be shot dead by an unseen assailant, but take it from me - that guy was doing you a favor! If there is a decent game buried deep down in this CD somewhere, I'd be surprised. Highlander is beyond awful - it's embarrassing. Why is the main character's hair blonde in the cut-scenes, yet bright pink in the game?? Equally shameful is the box art, which depicts Highlander as a blonde woman in what appears to be a cheap Aquaman outfit. If Atari expected garbage like this to pass as a legitimate game, perhaps the company deserved its untimely fate. © Copyright 2007 The Video Game Critic. Here's another polygon shooter from Atari along the lines of Cybermorph. It even has the same woman's voice. In Hover Strike you control a hovercraft on missions to destroy targets on various planets. While trying to locate your targets, you'll be attacked by all kinds of alien ships. The controls are pretty awkward. The fire and accelerate buttons are right next to each other, and you need to hold down accelerate to maintain your speed. In addition, your missiles can only be launched via the keypad, and it's tough to find them in the heat of battle. All the missions take place at night, which serves two purposes. First, it helps alleviate the "pop-up" problem found in most Jaguar polygon games. Second, it makes it impossible to tell where enemy shots are coming from! The graphics are very average, and the frame rate gets pretty choppy, especially when you're crossing rough terrain. A few stages are almost pitch black, and you'll be begging for them to end. On the positive side, you can select your missions, the music rocks, and their explosions are very cool. There are some neat camera options that let you view the action from different angles, but these aren't very useful during the game. © Copyright 2001 The Video Game Critic. Songbird has done it again, bringing another long-lost Jaguar game to the masses. Hyper Force is a fun platform shooter with exceptional sound and extremely large characters. You'll spend the first few levels exploring space caverns, jumping ledges, shooting robots, collecting items, avoiding traps, and searching for some very elusive switches. The stage designs are a bit uneven, with some that are difficult to clear and others that seem to end prematurely. The small switches you need to pull can blend into the surroundings, and you'll sometimes find yourself going in circles looking for them. Hyper Force has a LOT of secret areas, so always feel around the walls and ceilings. Your enemies include a wide array of robots, and they look pretty cool. Some look like odd top-heavy droids, while others resemble stormtroopers from Star Wars. Your firepower is very weak to begin with, but you can purchase better weapons between stages. Unfortunately, the weapon-buying screen is confusing, and it's hard to tell what you can buy and what you already have. You'll find bunches of money signs and other bonus items throughout the levels, and it's satisfying to walk or jump through them. The traps include your standard timed fire and spike mechanisms, but these aren't too tough to avoid. The controls are responsive, although touching a robot will send you out of control, and sometimes you get bounced around like a pinball. Fortunately, this damages the robots more than it hurts you. The gameplay starts to feel somewhat repetitious after a while. Although the scenery changes every five levels or so, the stages at each location don't differentiate themselves very much. The understated music is amazing, and the sound effects are also distinctive. You can save up to three games to cartridge. Hyper Force is a quality game that fills a void in the Jaguar library. Get your copy at Songbird Productions. © Copyright 2003 The Video Game Critic. 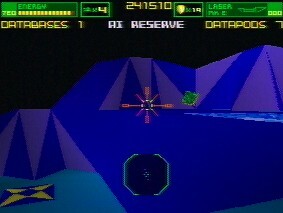 The Jaguar has many primitive polygon shooters in its library, but this one is particularly bland. 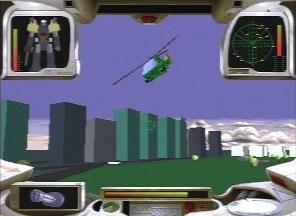 The levels take place inside a computer, which essentially gave the programmer an excuse to create the most blocky, uninteresting scenery EVER. You teleport between different rooms, trying to collect data pods while shooting enemies. Some stages contain simple puzzles that require you to hit switches to access new areas. As a first-person shooter, I-War needs a strafe button in the worst way. Most confrontations amount to trading shots until someone blows up. There are some nifty explosions, but they tend to slow down the action considerably. I-War does feature some respectable techno music, and I like how you can save your place between stages. There's also a bonus stage that lets you collect pods as you fly through a tunnel, but it's hardly what I'd call exciting. I-War is a playable game, but there's not enough here to make you want to come back for more. It's one of those games you forget about the instant you turn it off. © Copyright 2003 The Video Game Critic. This is one of those "mech" games where you control a giant robot. It's a little slow, but it plays well. There are sixteen missions, and you can select the order in which you play them. Your mech has mounts for up to six weapons that you can select before each mission. Switching weapons is done via the keypad. The control scheme is pretty well thought out. Once you start moving, you can change direction without stopping. That works out well because your robot walks at a slow pace, and having to hold down a button to move would be tedious. Missions usually involve destroying certain landmarks. The cities are full of rectangular block buildings without much detail. You can destroy the buildings to find weapons or power-ups. Your enemies, which include tanks, helicopters and other robots, look great. Unlike games like Cybermorph, the animation here is very smooth. But I think the best part of Iron Soldier has got to be the explosions: they look awesome. They make destroying things all the more fun, especially when you throw a big grenade into a group of tanks. © Copyright 2002 The Video Game Critic. 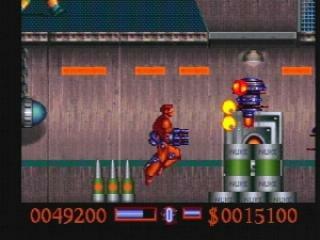 The first Iron Soldier game was a standout title for the Jaguar, with its mission-based gameplay, smooth animation, and cool explosions. Iron Soldier 2 is more of the same, with enhanced graphics and more advanced controls. The intro features some cool cinematics of your mech wandering around a city blowing everything to bits. There are twenty missions this time around and more weapons too (including a chainsaw). My main problem with this game is that the missions are sometimes a bit ambiguous. It's not always clear what you're supposed to do, so you end up leveling the whole town! Also, I sometimes had a hard time controlling my mech. This game really requires a good investment of time before you can really sink your teeth into it. Although it's a CD game, you won't even notice the loading time. The futuristic soundtrack is solid. Iron Soldier is a tough game, but Iron Soldier vets will feel right at home with it. © Copyright 2002 The Video Game Critic. Wow, Atari must have been intent of having a Mortal Kombat-style game for their Jaguar system. Kasumi Ninja offers some decent digitized graphics, but its gameplay is just pathetic. It tries to mimic the bloody fighting style of Mortal Kombat, but it doesn't feel right at all. The control is lousy, and Atari didn't even bother listing moves in the 61-page booklet (written in about 20 languages). The roster of eight fighters is uninspired at best. The two obligatory "ninjas" are dressed in cheap jumpsuits that make them look more like hospital orderlies! Most of the others are extremely unattractive, including the Scottish fellow who shoots fireballs from under his kilt. Kasumi's visuals aren't bad at all, with smooth animation and picturesque exotic backgrounds. The sound is less impressive however. Each fighter is introduced by a guy with a laughably fake Asian accent, and sound effects during fights are sometimes out of sync. The music is an odd mishmash of styles, but most of it sounds like some guy goofing off on a Casio keyboard. Kasumi Ninja is a sub-par fighter, even for the Jaguar. This game caused my smart-assed friend Scott to quip, "I never thought I'd ever utter these words, but can we play Ultra Vortek?" © Copyright 2006 The Video Game Critic. 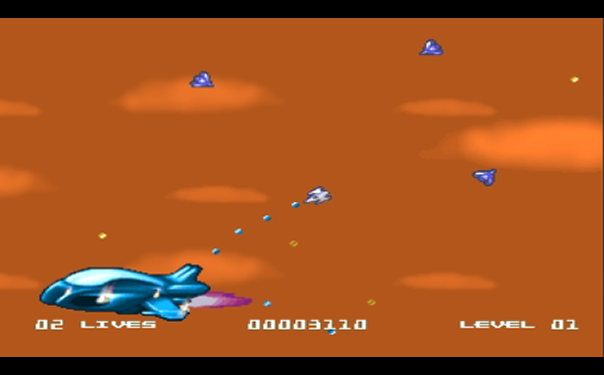 This new homebrew brings the 2D shooting fun of Time Pilot (Colecovision, 1982) to the Jaguar. It's hard to improve upon a classic but Kobayashi Maru is not a bad little arcade game. You guide a ship freely around a screen that scrolls in all directions. 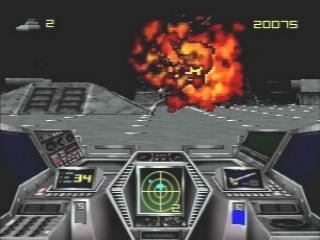 Enemy planes approach from the edges, and I like the ability to spray rapid-fire bullets by holding in the fire button. The bullets are pretty fat too so you won't miss very often. There are also chubby little guys on balloons you can "rescue" for bonus points. Shooting the balloons will release the little fellow, so try to position yourself below him first. After a while a large "boss" airship will make an appearance. The bosses are unique in design but easy to defeat once you position yourself behind them. Beating the first stage takes practice, but after that things get easier - probably because you earn a free life for completing each stage. One thing lacking from Kobayashi Maru is variety and a sense of progression. Time Pilot created a sense of anticipation as you worked through the distinctive ages of time. 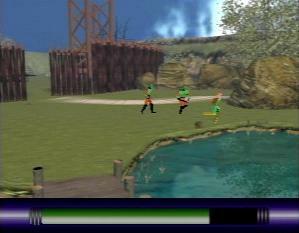 In this game each stage features only slightly different skins and color palettes. The "warp" animation between stages is nice but unspectacular. Kobayashi Maru is a perfectly playable shooter but I can't shake the feeling that there should be more to it. © Copyright 2013 The Video Game Critic.